The KLTA Recognizes that its future and the success of the organization are founded on the education and professionalism of its members. Licensing by the Kansas Insurance Department is an important measure in the advancement of the personal and professional development of Title Professionals. 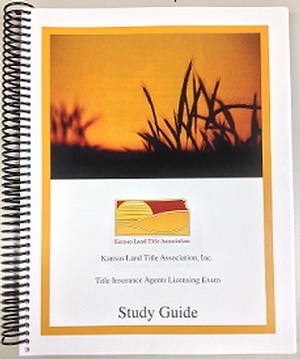 The Study Guide is a manual not only intended to help in preparation for the Title Insurance Test, but also serves as a valuable reference and resource for the rigors and everyday challenges of the practice of insurance professionals. Members $65; Non-members $130. Includes shipping and handling.